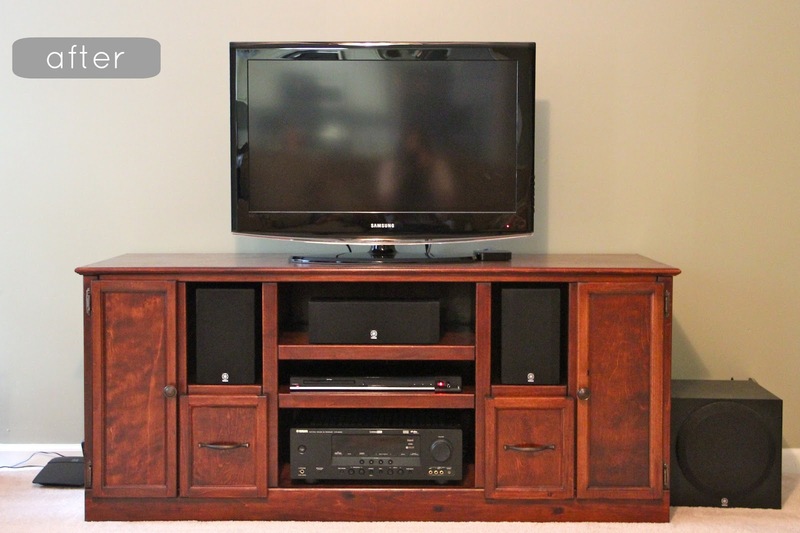 ...so this is what we were working with before: a junky TV stand we picked up from Walmart after we first got married. Caleb and I hated this thing: our sound system was exploding out of it and all of the wires and cords drove me insane! After we bought our house last year, we spent months looking for an entertainment center. We didn't want it to be too big, we didn't want it to have doors, we didn't want it to take up the entire wall. We were picky, to say the least. We also wanted it to fit our sound system neatly so that it didn't look like such a disaster. We looked and looked but never found anything that we liked. Oh my gosh, Sherri I love it! Caleb did such a great job!! I have never heard of dying wood instead of staining - the result looks fabulous! I love the color you chose and everything looks so perfectly contained and sleek but still has character. I am so impressed! I am going to show this to Michael :) The speakers & cords never seem to be hidden well in our house! Beautiful work, Caleb!! You did such a great job! We are very impressed with your skill and expertise and we're so proud of you! WOW! That is sooo beautiful! He did a great job! It looks fantastic! He did a wonderful job! wow - that is just awesome. so cool that he made that - if i was you i'd also have a list of other things i'd want him to make! such a great project and such a great job! It's just the right size, too! Dang! That looks amazing. Great work!